A robust, efficient, proofreading enzyme that gives increased fidelity in high-yield PCR, for use in all routine cloning applications. ACCUZYME™ is a proprietary proofreading enzyme that offers increased-fidelity and high PCR yield, even in demanding applications. ACCUZYME has an error-rate of 3.0 x 10-6 and results in blunt-ended amplicons up to 5 kb in length, making it ideal for use in cloning and site-directed mutagenesis. ACCUZYME is supplied with a buffering system that provides ideal conditions for most PCR assays. Consequently, the cost and effort typically associated with optimizing assay performance is often eliminated. In circumstances where further optimization is required to improve PCR specificity and/or yield, ACCUZYME includes an additional vial of MgCl2. An 800 bp fragment was amplified from 500 ng, 50 ng, 5 ng, 0.5 ng, 50 pg and 5 pg (lanes 1-6 respectively) of human genomic DNA using ACCUZYME. HyperLadder 1kb (M). The result illustrates that ACCUZYME gives high product yield even from limiting amounts of template. Increased-fidelity and high product yield from even complex templates. What are the optimal extension conditions for these polymerases? ACCUZYME DNA polymerase has an extremely fast extension rate compared to other proofreading enzymes, which are naturally slower than non-proofreading polymerases due to their ability to go back and correct nucleotide mis-incorporations. 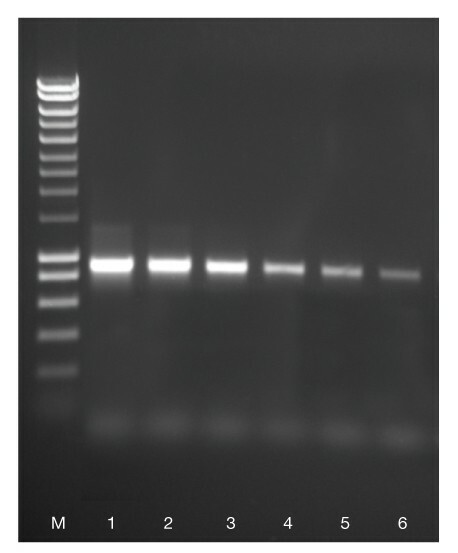 These polymerases will extend at a rate of as little as 30 s/kb, depending on the template amplified. Extension should be carried out at 68°C for optimal results. How long a fragment will these polymerases amplify? ACCUZYME will process up to 5 kb fragments.